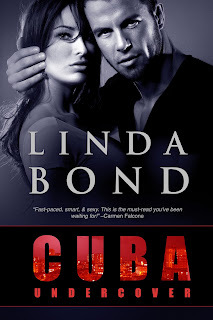 I ran into an interesting problem writing my romantic thriller Cuba Undercover, releasing today. History began changing, and my novel had to keep changing with it. Set partially in Cuba, much of the conflict revolves around the tension between the United States and the island nation. Antonio Vega left Cuba after a government watchdog murdered his father. My hero has spent his entire adult life plotting to get revenge against his father’s killer and rescue his family from Cuba. And then, President Obama reached across the Florida Straits and began re-establishing relations with our former enemy. So, I had to change some facts in the story. Even though its fiction, it must be believable to the reader, and Cuba was and currently is still in the news. Each edit pass brought more content changes. More Americans were allowed to travel to Cuba. More Cubans were allowed to leave their homeland legally. And Cuba is no longer considered state sponsors of terrorism. With each changing reality, I felt more pressure to change and quickly release this book. One thing hasn’t changed. You can’t be an American reporter in Cuba without consent of the government and a license to work. My heroine, TV reporter Rebecca Menendez, is persuaded to sneak into Cuba illegally and document a rescue. Here’s an excerpt where the hero and heroine realize their cover is about to be blown – and my hero decides to use passion to save them. “No se muevan!” Don’t move. The younger cop was losing his patience with her. Damn it! Even if she drew her father down from his well-protected office, Antonio wouldn’t be able to get a shot off without one of those cops shooting him as well. And then they’d shoot Rebecca. The realization hit him like a bullet. This was not her battle. His father’s murder was not her fault. He did value her, but no longer as bait. And he didn’t want to damage her irreversibly. He didn’t want to hurt her at all. He rolled his head, his neck cracking. What should I do now? “Rebecca, my love, talk to me please,” he yelled across the distance between them. She hesitated, surely confused at the change in the tone of his voice and his choice of words, but she didn’t stop, despite Antonio’s plea and the cop’s demand. “Have you lost your damn mind? Running like that?” He spoke in Spanish. “Kiss me,” he whispered into her ear. Enter to win a $25 Gift Card.